I am so excited to share today’s post because it comes with some fun news! So you all know how much I love Lolë (learned about the brand through a collaboration a few years ago, and have been obsessed ever since). From their belief that wellness is a lifestyle, designing pieces with a genuine concern for people, products and positive impact (their swimwear line is made from recycled yarn), and an entire section dedicated to eco-conscious items, there is so much I love about this brand. More than ever, I realize the importance in knowing what you are buying — you can find out more about the brand and what they stand for over on Instagram – @lole. So, while I have been styling these pieces for a while now, they FINALLY came out with a men’s line and let me tell you Matt is hooked! He is a tricky one when it comes to shopping and is very particular about fit, quality, etc. Immediately, he could not believe how comfortable and a perfect fit all of the pieces he selected. As I write this, we are packing for California and he has already packed up all his new pieces for our trip! I have to say, in my opinion, the fit of Lolë’s men’s slim straight leg jeans are amazing! They have a tailored, slim-fit and just enough stretch to move when you move. While we were out shooting Matt kept mentioning that the best part of these jeans were the angled front pockets so nothing would slip out. 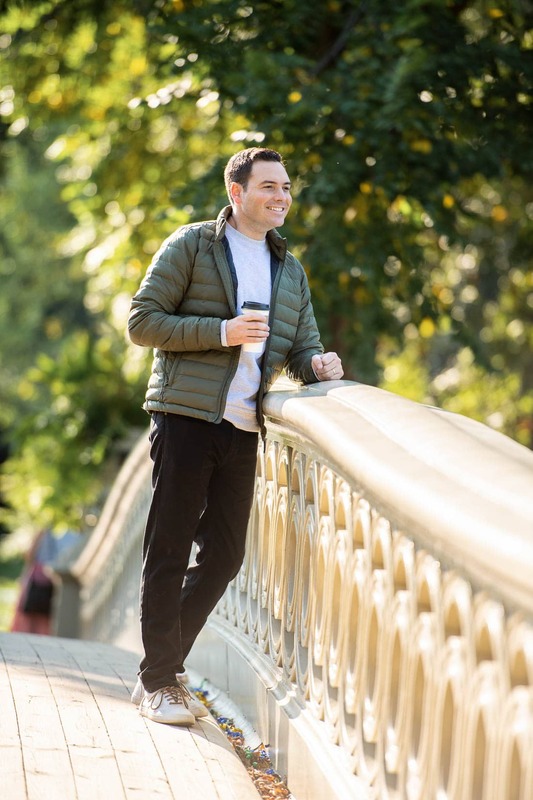 A few other favorites from the men’s collection that Matt is wearing is the Irving packable jacket (4 colors) and Elliot crewneck sweatshirt. The Irving Packable Collection is super light and has a peached finish to its outer layer which makes it feel almost velvety smooth to the touch while remaining highly technical as well as it can repel rain, wind, and snow. The Irving Collection is a must-have as it packs into a tiny pouch while being super versatile as it can be worn in the city streets as well as keep you super toasty in the mountains. Investing in a lightweight, packable jacket is key for both men and women. I have and love this style which is a new style for Lolë and we both have ours packed for our California road trip! This new Fall style for Lolë is insulated in the front & back with LOFTECH™ which is a vegan alternative to natural down! LOFTECH™, which is made by ALLIED feather & down, has the loft of 625 fill-power and the warmth of 700 fill-power goose down. Its synthetic clusters mimic natural down which provides a real down feel and look, a win/win all around. LOFTECH™ clusters are able to bind to each other better than other 3-dimensional synthetics as they are able to trap more air and ultimately create more warmth. This incredible vegan insulation also adheres to the bluesign© standard which is built around five principles; resource productivity, consumer safety, air emission, water emission, occupational health and safety.